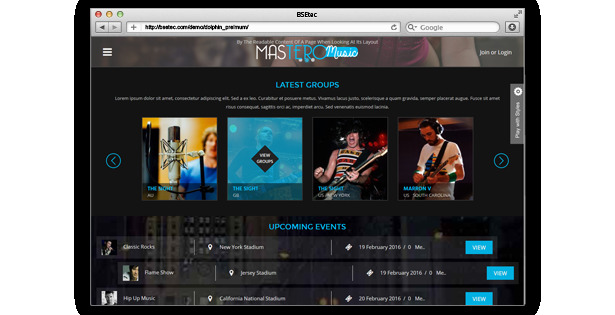 Mastero is the right choice, if you want to create a unique social media website for music. This simplified Dolphin template is packed with bashing features, which can be customized with your own creativity. Within fraction of seconds you can change the theme colors, banners and the entire setup, with the user friendly admin panel. 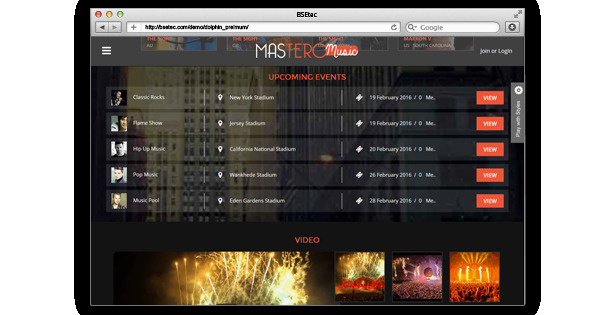 Mastero template, developed with the advanced UI, can bring implausible user experience to every visitor. One-fits-all responsive layout brings far-fetched satisfaction through all the devices, including Smartphones, tablets, PCs and laptops. 2) Order of the Layout blocks on the splashpage can be changed. 3) Background image of the blocks can be changed or deleted. 4) A block can be deleted, if proved unnecessary. 5) A new block can be added from the Mastero box, which includes all the customised blocks; while the Default box includes the Boonex blocks. 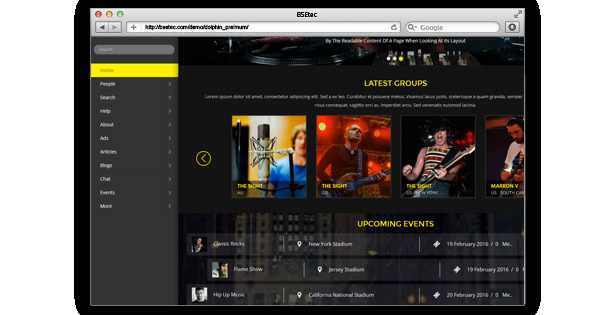 6) The admin can enable ‘Guest’ option, if all the visitors can enjoy the customized layouts. On the other hand, the admin can also disable this option. 7) The admin can enable ‘Members only’ option, if the customized layout can be viewed only by the members, who login into the website. Otherwise, the admin can also disable this option. 8) In the colorization, the admin can now choose from unlimited color option for the layout. To create an attractive homepage, the blocks like, Events, Videos, Photos, Members, Blogs, Forums and Quotes can be enabled or disabled instantly, with flexible enabling feature, included in the backend admin panel. Footer manager module on the backend facilitates to add menus, submenus and html code; to sort menus; and to add boonex default functionalities like newsletters for easy navigation and to give additional information about the site. 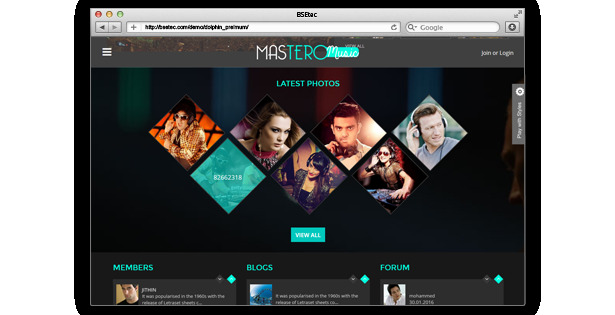 Mastero has 100% responsive layout in every element of the template, including the sliders, giving an awesome look at various screen sizes from PC monitors to tab and mobile screen size. It can attract your target audience through any type of device! Mastero encloses entrancing responsive slider feature that allows you to generate startling slides to boast with your content. The slider is an exclusive feature of Bse panel and it allows the user to take absolute control over the slider. Bootstrap is a HTML5 & CSS3 framework, designed to help you develop new web apps for your sites. 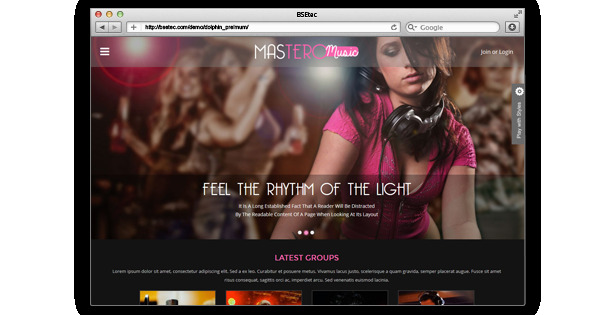 Mastero is developed using this technique so that your site is updated with various charts and easy navigation. 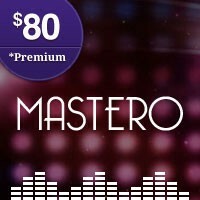 Mastero theme comes with a layered psd file, which helps to instantly build a mock-up for a new page and to create preview images, to explain the visitors without hard hitting efforts. We have added social share option in the back-end so that you can quickly and easily insert your social media links through the admin panel. This template is beautiful! Very impressed with the look and interactivity of this template. Support has been amazing too, Im a person to ask a million questions and they have been very responsive. Thank you! I look forward to working with the developer of this template and have some customization done :) Thanks again! Beautiful!Im very impressed with template it’s so smooth and fast,and with outstanding Support what more can you ask for. Thanks folks for giving this Mastero template ! Its very useful for me to show my website with unique view and very responsive.. Bsetec has outstanding templates with exclusive designs. I really appreciated their instant support. Professional all the way. I just installed this template, I am never failed to be astounded by how beautiful your products are, this template has absolutely blown me away..... I LOVE it! Also extremely easy to install, just a few easy steps and WOW you have an amazing website, THANK YOU BSETEC!!!!!!!!! How do i change the background of the theme? Many Thanks!! Template beautiful design changed and tinkered! Vielen Dank!! Template schöne Design geändert und gebastelt! what is the time to compatibility with dolphin7.3.5 ? Thanks for your interest towards our template ! Its compatible with dolphin 7.3.5.